My niece has a twin sister who also has a daughter so that meant I would haaaave to make another little dress, oh the hardships :) It is so hard to make cute little girl clothes..... NOT. 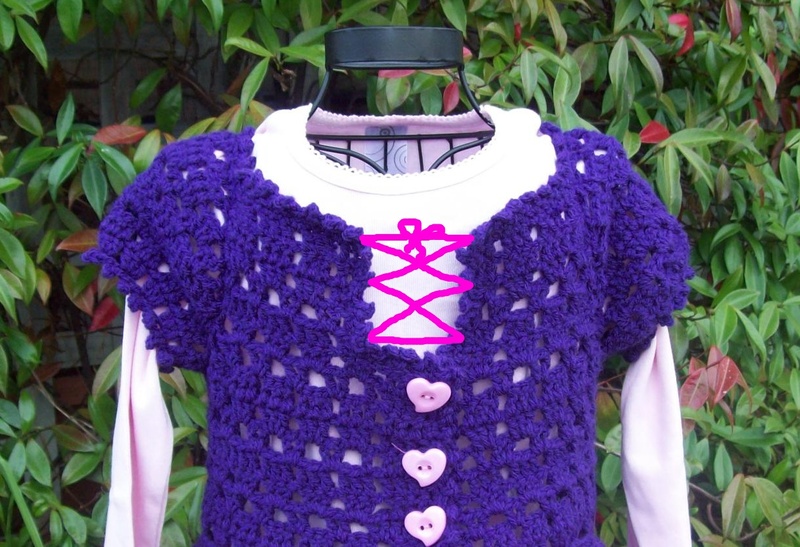 After looking at my boys dark clothes it is so nice to make something pink and pretty. 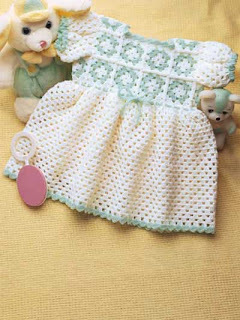 I had a look on the internet for a pattern to use and found LOTS of adorable dresses. I decide to make a little dress to go under the crochet dress as it is an open pattern and it is winter here. My first plan was to make one in cream but after trying cream behind it I decided it needed a stronger colour. It took me awhile and just as I was about to give up this lovely bright green jumped out at me. I also added a trim of cream lace which just pokes out from the bottom of the dress when worn. I had a little chuckle when I made this dress as I used the same pattern that I used for my sons shirts years ago. It is from the Kwik-Sew's "Sewing for baby" book. I wanted to give it to my niece before Sunday so that her daughter could wear it to church if she wanted what I didn't realise was that it was Ebony's birthday on Saturday so it was perfect timing. Not sure what I'm going to do now but I will need to organise a project as I think I may be spending a bit of time sitting quiet as my Asthma is playing up with all the cold and very damp weather we are having at the moment. Wow! You only learnt to crochet under a year ago? You're making beautiful things. Well done! !